Last month VDL staged a press event at the premises of Solmar Tours at Maarheeze in the south eastern area of the Netherlands. 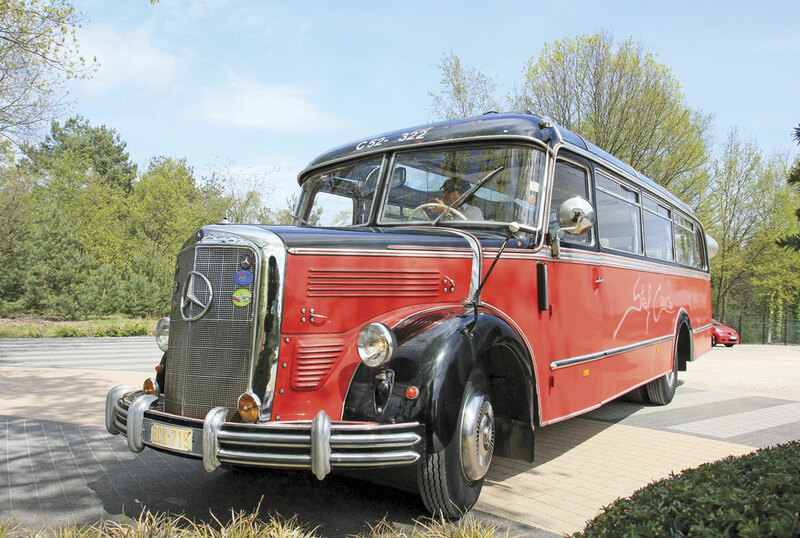 It is a tour company that was established in the early 1980s by the Engelen family, specialising in back to back shuttle services to Spain. 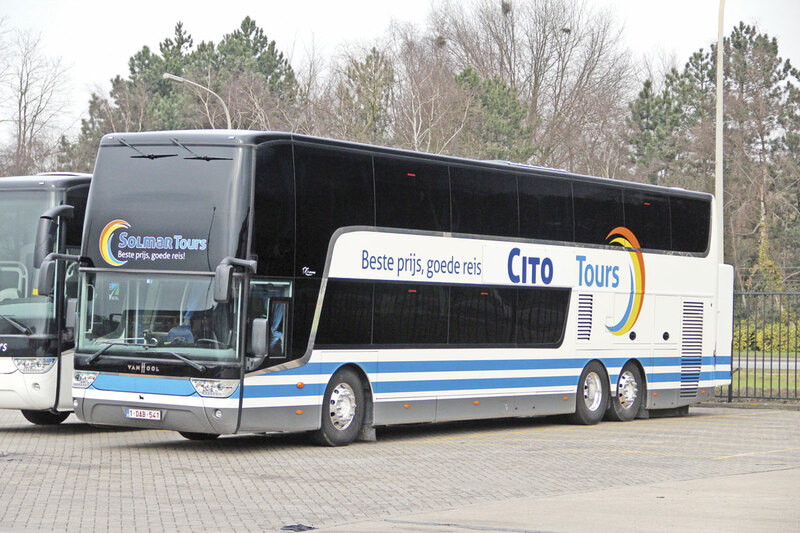 It owns no vehicles, instead contracting in the services of five separate operators, two of them Belgian and three Dutch. 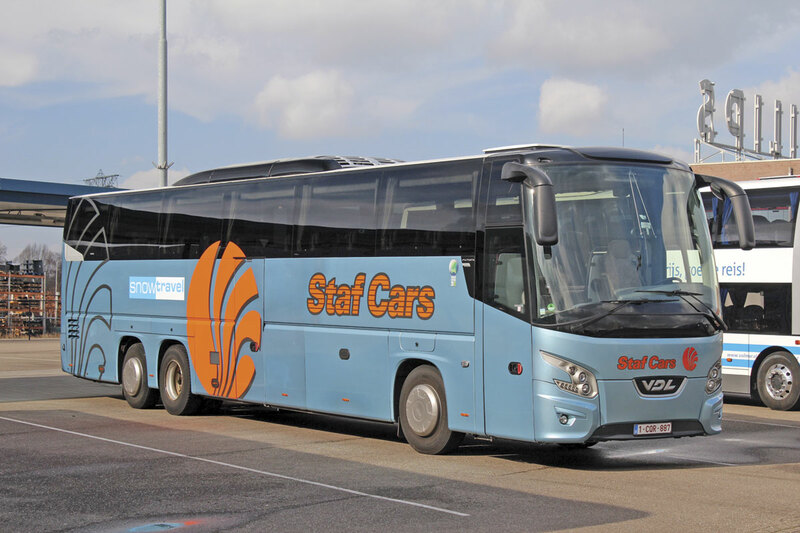 In addition to the Solmar commitments, Staf Cars operates 20 single deck coaches, most of them VDL Futuras including seven FHD2s currently being delivered, on incoming tourism, day trips and on behalf of other tour operators, 40 coaches on school transport work and five minibuses. It does not undertake public transport work at present but Paul did not rule out doing so at some time in the future. The average age of the 40 front line coaches is three and a half years, while the average of the school fleet is 7-8 years, with the oldest being around 15 years old. The school fleet is a mix that includes VDL/Bova, Van Hool, Mercedes-Benz, Irisbus-Iveco, Fast, Temsa and Otokar. 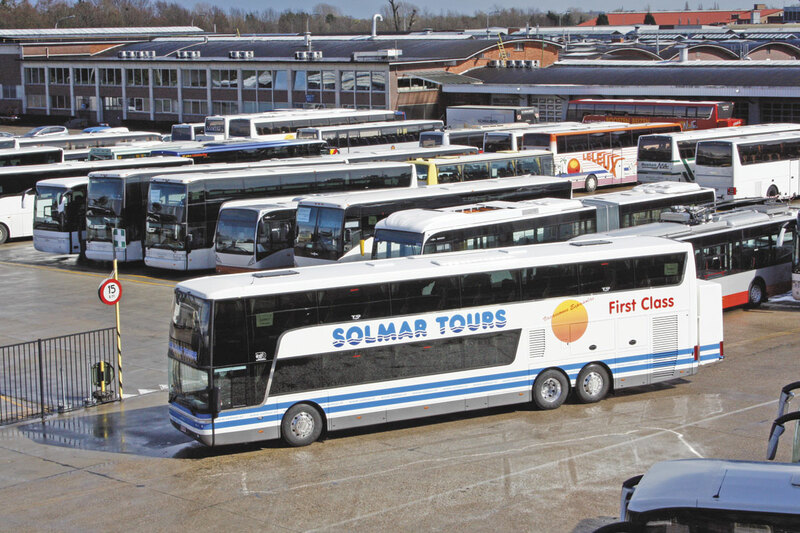 Annual fleet mileage is around 6,500,000km, which coincidentally is roughly the same as coaches contracted to Solmar Tours cover. It employs 140 people, 130 of them drivers. 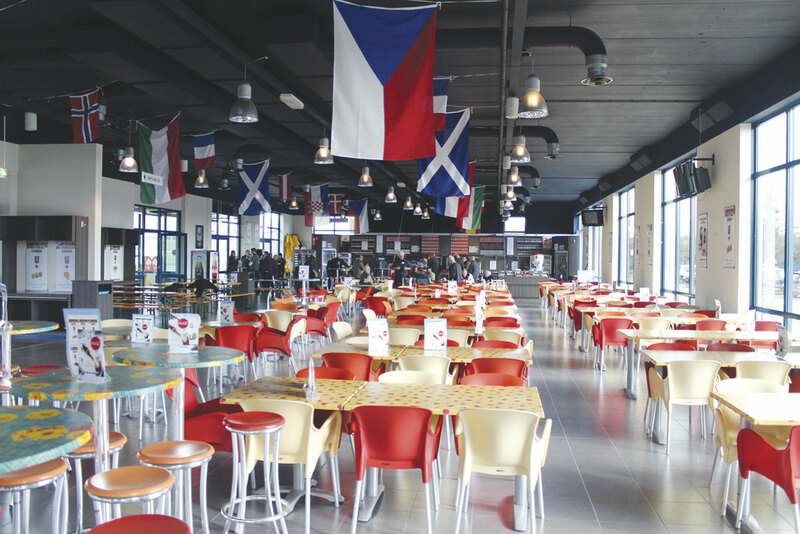 At the time of the acquisition, Solmar was already Staf’s biggest customer and the well established business model was maintained along with all of the existing contractors. There have been some minor changes, notably the style of the company logo which previously incorporated wavy letters that did not easily reproduce when reduced on electronic devices and the ‘Vacaciones Espanolas’ strap line which became limiting as the business was already sending over 4,000 people to Croatia annually. 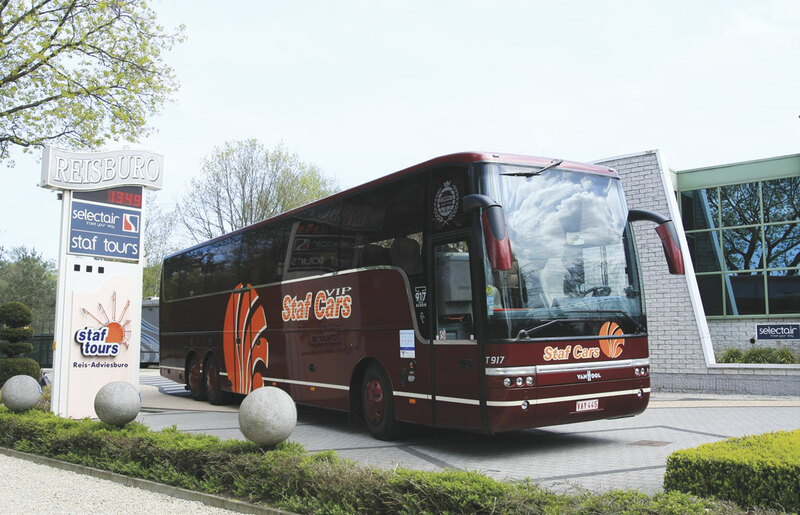 However, the core concept of direct selling holidays by coach remains the same and is reflected by the ‘Beste prijs, goede reis!’ (best price, good travel) slogan now employed on the vehicles and marketing material. 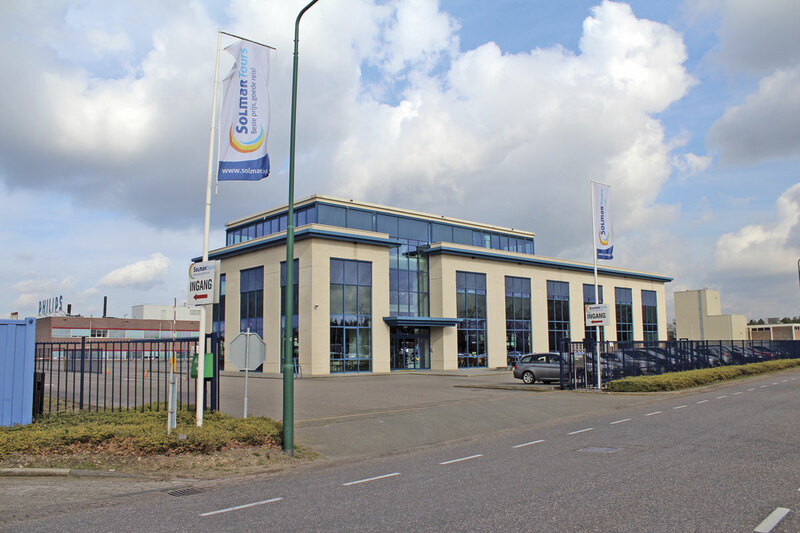 Solmar’s Maarheeze combined headquarters and departure/transfer facility is a very impressive three storey building with a vast café/restaurant on the ground floor and offices and meeting rooms on the upper floors. With a 550 space car park and a railway station just down the road it is easily accessible, also benefiting from proximity to the motorway network and near to the German and Belgian borders. At its busiest during the summer season, it can handle up to 3,000 passengers within an hour. From April to October, departures are every Friday and Monday with returns on Sundays and Wednesdays, but in winter all departures are on Fridays and returns are on Sundays only. The programme is advertised by means of colour brochures with a 220,000 print run, the latest summer 2014 edition of which has 116 pages and, for the first time this year, a separate 36 page pullout price list. Of these 180,000 are mailed to the existing client list. An astonishing 81% of bookings are repeat customers. Prior to what Paul refers to as ‘the crisis’ passenger loadings were 100,000 annually but he admits that this has dropped to 85,000 since, though there are signs of recovery of around 5% this year and the business has remained profitable. This year, internet bookings represented 50% of the total and Paul believes that this will continue to grow. The other 50% were generated by direct calls from the sales team with a small amount of walk in bookings at Maarheeze. No outside agencies are used. A variety of Spanish destinations is offered. Last year, Solmar took 30,000 holidaymakers to Salou, ‘more than anybody except the Russians’; 10,000 to Benidorm, a figure that is rising; 2,500 to Peniscola; and over 5,000 to Istrie in Croatia. Not every destination retains its appeal forever, explained Paul who said, ‘Lloret de Mar has died for us, with only 1,800 people taken there last year’. The tours and excursions programme includes trips of five to 13 days duration and takes in Italy, Croatia, Austria and the Czech Republic among other destinations, though for reasons Paul cannot fathom, they are completely unable to sell Paris despite having tried. The company’s average client is 41 years old, an average that is increasing by one year each year at the moment. Paul thinks this phenomenon is because in the current recession, young families with young children have been disproportionately impacted, and that as things start to recover the average age will drop again. However, he did stress that they did not seek custom from the young drinkers market. As well as the coach holidays, Solmar also offers a flight holiday programme to Spain to destinations such as Majorca, and car holidays in Spain and Croatia. 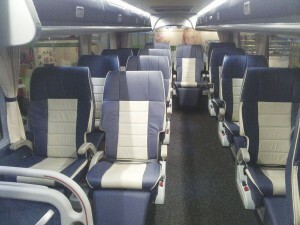 The operation is characterised by the use of luxury double deck coaches. There is a long standing relationship with Van Hool and also with VDL and contractors are free to choose either to meet their commitments. All are 14.1m long and all have the 510hp DAF MX engine with ZF AS-Tronic transmission. Paul said that Setra had tried to sell him the TopClass S431DT double decker but he would not buy it because he thought the company was not flexible enough in meeting operator requirements. Apart from a higher purchase cost, with consequently higher insurance and finance charges and higher depreciation equating to €30,800 (£25,388) compared with the VDL, a particular point was the overall length of 13.85m compared with the 14.1m of the Van Hool and VDL which meant that it could only accommodate 64 Royal Class 2+2 seats compared with 66 in the other two. 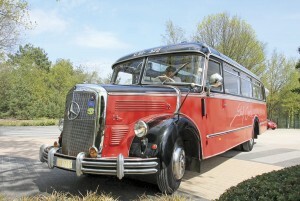 It meant an annual cost of €10,000 (£8,243) which was €40,000 (£32,972) over the vehicle’s four year stay in the fleet. 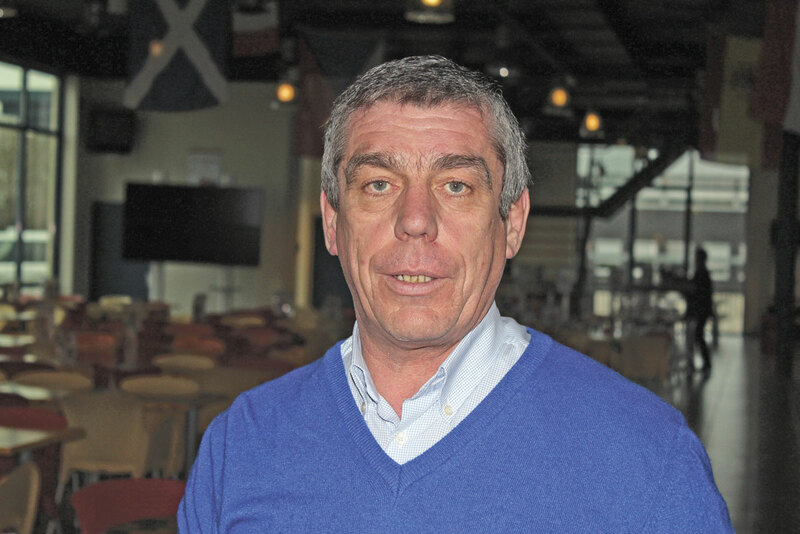 In his opinion, the most important quality a manufacturer needed was flexibility and he was happy that VDL and Van Hool provided him with that, delivering specification changes that enabled him to meet the needs of his customers. 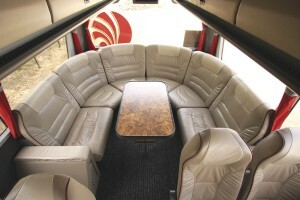 Paul believes that if the journey is over 800km the passengers need more luxury and room in the seats. An increasingly popular aspect of the offering is ‘First Class’ travel in 2+1 luxury coach seats rather than the standard 2+2 arrangement. They are set at the same 96cm spacing at the Royal Class seats and also offer the same 40degree recline angle. At present all of the First Class coaches are Van Hools using a seat design that Van Hool developed specially for Solmar’s needs. Of seven new Van Hools that have gone into service this year, four have the 2+1 layout. Paul recognises that there will be an issue with the 2+1 layout in the secondhand market and for this reason he anticipates they will need rebuilding prior to resale. Despite the fact that they will have between 750,000 and a million kilometres on the clock after four years in service, he has found that Solmar deckers command good secondhand prices. He had sold one to Slovenia on the morning of the day I spoke to him. They are never older than four years and typically command 50% of the initial purchase price. They are always well kept and in good condition with any issues of which the company is aware resolved prior to sale. 2014 has seen a significant departure from the hitherto all double deck fleet policy with the purchase of a single deck VDL Futura FHD2. 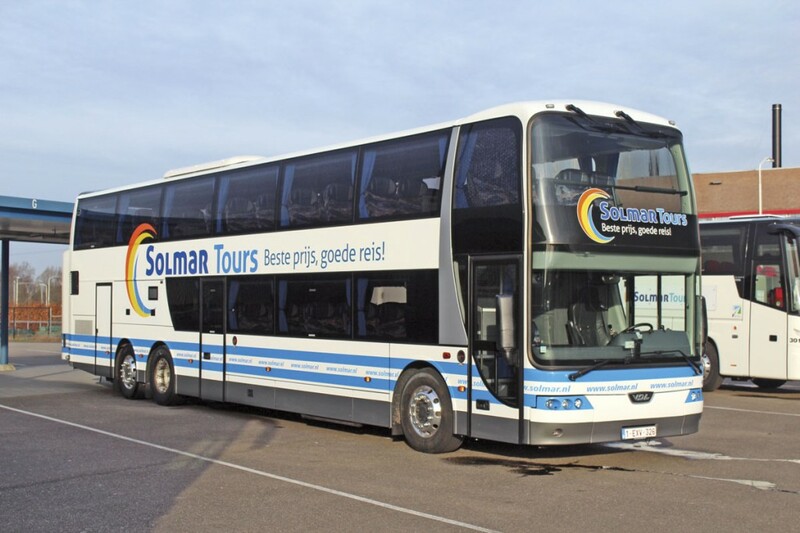 This is specifically for use on Solmar’s excursions and tour programme and recognises the fact that passengers on these services prefer to have contact with the driver and therefore do not want to be in a double decker. Paul believes that two of the most important factors in staying at the top are seats and drivers. To this end, training is something he takes very seriously. In addition to the mandatory 35 hour of Driver CPC training that drivers on Solmar work have to take, they also have to attend an annual training seminar every March at the headquarters building. This focuses on dealing with customers and specifically addresses long distance work. The latest initiative is to start providing English classes for drivers on incoming work. Furthermore, before any driver is allowed out on tour, he has to go through a practical alpine training exercise. The programme for this is very intensive, taking place over five days and involving 15 hours a day. The customer training appears to pay dividends because Solmar’s passenger satisfaction rating is 94% and complaints are four times lower than the Dutch average. Most complaints that are received are about hotels. The company has won the Zoover award for satisfaction (a Dutch organisation similar to Trip Advisor) for the past four years. Unlike many operators that play their cards very close to their chests, Paul’s approach is to be open and communicate his successes to other operators because he wants to raise the quality and perception of coach travel across the board. He believes that other coach operators are not his competitors it is the car and other forms of transport. Along with Mark Anderson of Anderson Tours in the UK, he is on the board of directors of GPN, the Global Passenger Network. ‘Talking together we come to a better result,’ he says. Research shows that Dutch people who are aware of the company associate it with coaches and Spain which is perhaps not surprising as Sol and Mar are the words for Sun and Sea in Spanish. One of Paul’s aims is to reposition the brand so that the company is equated with holidays in Spain using all forms of travel – it is already carrying 2,500 people annually by air. He is considering the possible use of another brand for the touring side. Perhaps surprisingly, he may consider acquiring an existing business that has failed to achieve this because he believes it is better to transform an existing brand than to start completely afresh. The third arm of Paul’s empire is Staf Tours, a smaller operation selling holidays, turning over €2m (£1.65m) annually. Together with Solmar Tours (€30m/£24.7m) and Staf Cars (€9.3m/£7.67m) the group’s annual turnover is €41.3m (£34m). It’s a big business carrying a lot of people and one that Paul is determined to keep developing.